A recent story shared via Facebook warns of the dangers of allowing children to eat rice cakes. Warning To All Parents: Don’t Let Your Children Eat Rice Cakes. Popular rice products found in grocery stores all over the world can be harmful to young children. A new study has found excessive levels of a carcinogenic substance in some well-known favorites and is issuing a warning to parents everywhere. However, there is no link to the actual study (the link behind "this study" actually links to an English red-top news story). Is there any truth to this story whatsoever? Do rice products routinely have high levels of arsenic? That's a bit subjective so by "high" are they in any way dangerous to children if eaten routinely/daily? According to Consumer Reports, it depends on the rice used and how it's being served, but it's potentially a problem for children, especially babies, but not that much for adults. We looked at data released by the Food and Drug Administration in 2013 on the inorganic arsenic content of 656 processed rice-containing products. We found that rice cereal and rice pasta can have much more inorganic arsenic—a carcinogen—than our 2012 data showed. According to the results of our new tests, one serving of either could put kids over the maximum amount of rice we recommend they should have in a week. 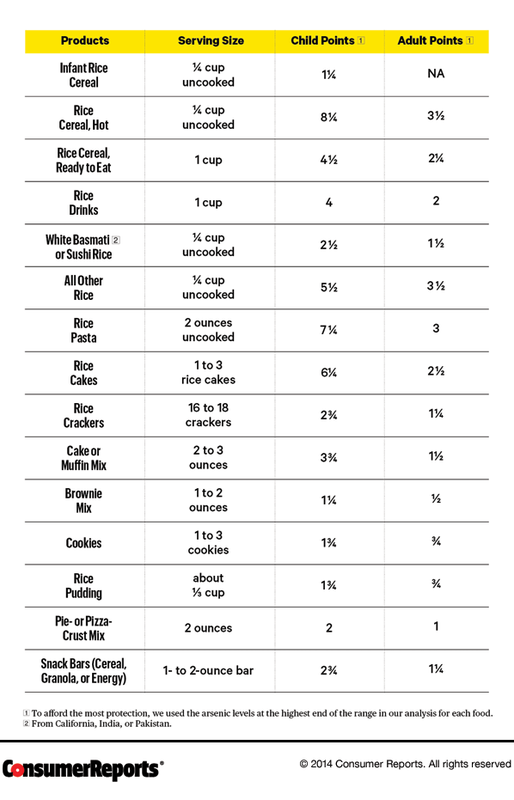 Rice cakes supply close to a child's weekly limit in one serving. Rice drinks can also be high in arsenic, and children younger than 5 shouldn’t drink them instead of milk. More detailed information on the levels found can be found on their Greener Choices site. This is based on an actual report. Not the answer you're looking for? Browse other questions tagged nutrition public-health . Are there harmful levels of mercury in High Fructose Corn Syrup (HFCS)?